The sun is still managing to melt the snow on the metal roofs of the barns. 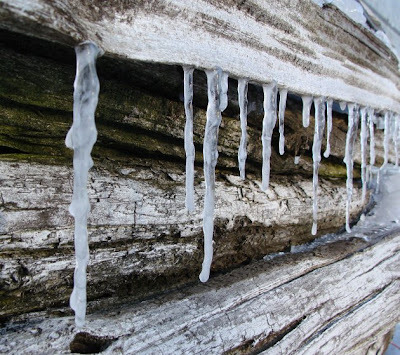 It re-freezes almost immediately, creating these icicles on the cedar fence next to the small barn. 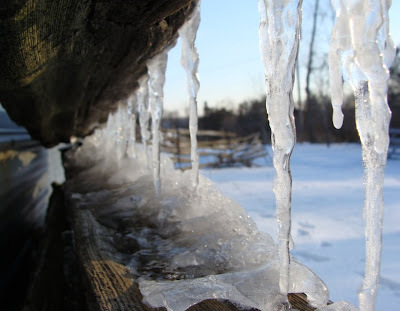 Icicles are so fascinating, especially when they form as quickly as this. I took some photos this afternoon of similar icicles on my balcony which formed in the same way yours did, which I'll post tomorrow. I love these on your fence. We're expecting -27C tonight here in NS. Eeek! Hi Amanda. What a great blog you have! I'm so envious of your emigration to Canada - we were thinking of this, but various family events overtook us and now it's probably too late given that we have one child in the last year of secondary school, and the other just starting GCSE equivalent and very well settled in school. Still, I have been living your emigration story vicariously, and am enjoying your gardening/self-sufficiency posts. I see you were in Aberdeen at one point - I did my first degree and PhD at Aberdeen, and loved the city and the university, despite the haar! Nancy you seem to be having a very rough winter in NS this year! Glad it's not just me who's fascinated by icicles, Lona. I'm surprised my kids haven't thought of eating them yet. Thanks Linda - appreciate your feedback! I loved Aberdeen too - particularly when the sun shone on all the granite buildings (although I was never very good at interpreting people who spoke with a strong Aberdonian accent - a bit embarrassing when I was working on a delicatessen counter during the holidays...).